February | 2012 | eating with S.O.L.E. I am literally licking my plate clean as I write this entry, this somewhat uninspired hump day meal was wonderful and complex, bright and fresh! Yum I love it when a few simple ingredients and a memory of flavor combinations turn into a delightful dinner success. I rarely if ever use recipes for meals I let my inspiration come from what is fresh (from the garden usually or pantry these days), what needs to be used, what is left over and then I let my pallet guide the accompanying flavors. 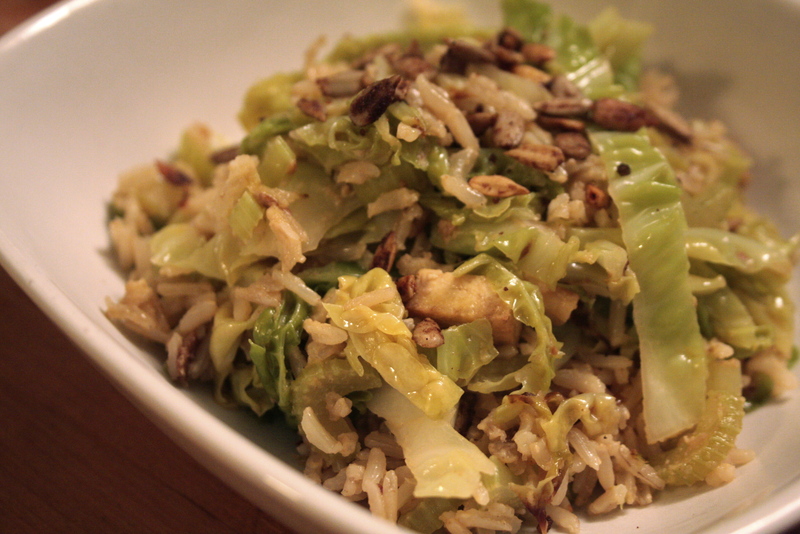 This dinner was born from a beautiful savoy cabbage and the memory of spicy sichuan dan dan noodles. I think I am slowly working my way through my dislike of muffins. 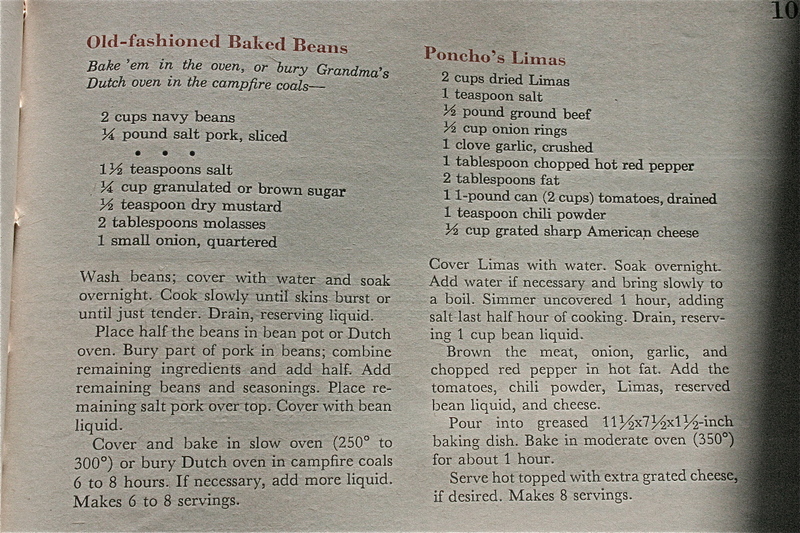 Recipes like this make it easy. We make a vegan version of this at the bake shack (using apple sauce instead of eggs) and it’s always a hit. I happen to have many eggs these days so I opted for eggs today. You could also sub apple sauce in for the sugar and make a great sugar free start to your day. I used spelt flour as usual, and today I blended hemp oil into my grapeseed oil. 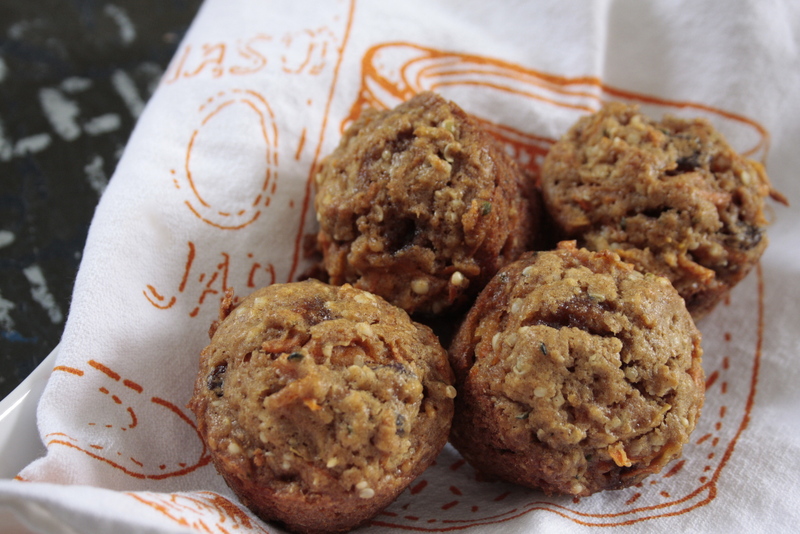 These are loevly, moist and dense, sweet with all the fruit bits and full of omega power. They look so lovely, and are perfectly fluffy and raise nicely, certainly they are NOT hockey puck muffins! Portion into prepared muffin pan, and bake at 350 for about 20 minutes. I used a rectangular mini loaf pan as well as a mini mini cast iron muffin tin, and yielded 8 mini loafs and 5 tiny muffins. My otha’ momma back in high school, was from Guyanna, she is a wonderful cook and about the best ‘best friends momma’ you could ask for. She made some killer pepper sauce, curry chicken, salt fish, and my favourite of her specialities roti. 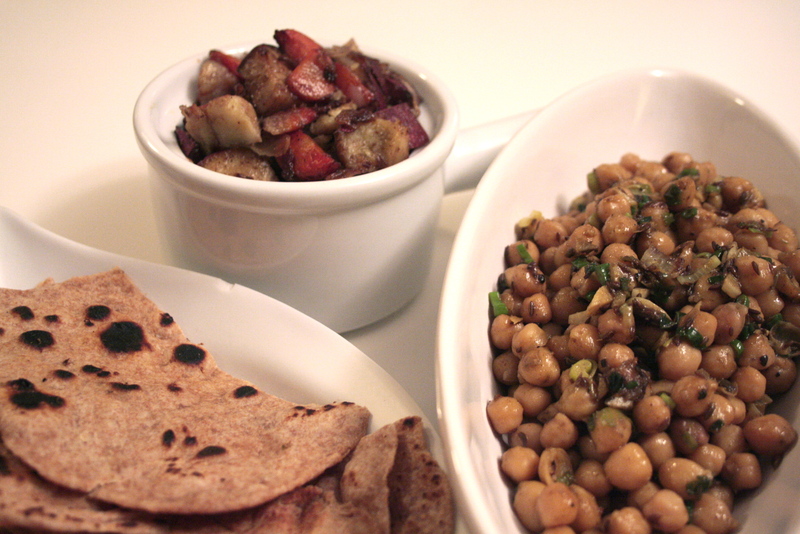 She tried guiding us girls through the roti making process one day but I think the beers got away with us, and none of the lesson really stuck, one recipe however has stuck with me all these years and that’s Pam’s chickpea green onion channa. The other night I was having a mad craving for some spice, heat and ethic flavours so I made a little vegetarian west Indian feast, complete with spelt roti and while it wasn’t the best I have ever made it still perfectly bundled up the yummy purple yams and carrots I slowly roasted slathered in Chamelea Giri’s Garama Masala spice blend (check out her etsy shop), and Pam’s channa masala. I don’t have the luxury of having a jar of Pam’s scotch bonnet pepper sauce in my pantry, so I used the next best thing; a locally made killer crazy hot Caribbean pepper sauce, and the results were simply perfect. We just needed rum and cola and some soul grooves to bring it all together. Admittedly the name of this cake drew me in and after I stumbled upon this recipe a few weeks back I was dying to rush out and buy a can of pineapple, and crack into the mountain of over ripe frozen bananas in my freezer. Who would have thought this banana bread / carrot cake hybird would be so delightful. I had no idea this cake even existed… Those southern bells sure do dream up some lovely treats. 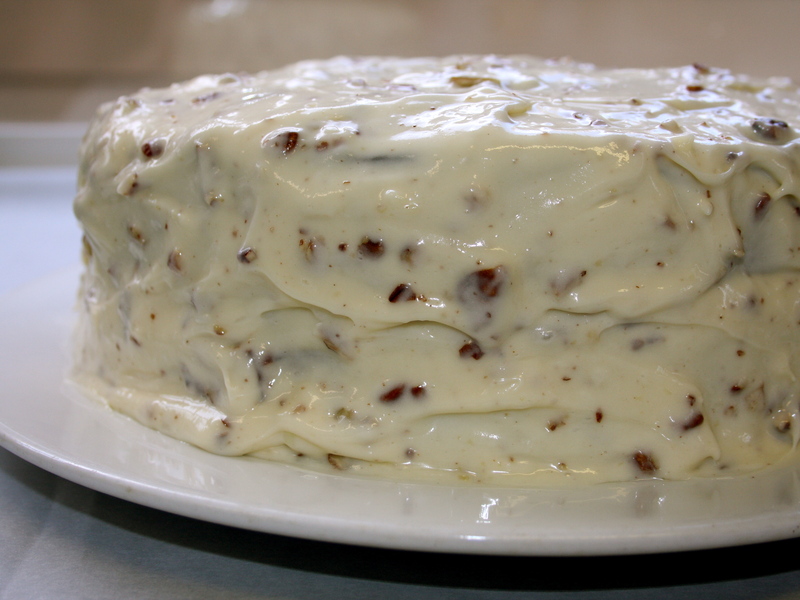 Slow roasted bananas in a dreamy cake slathered in pecan laced cream cheese frosting. Oh my. 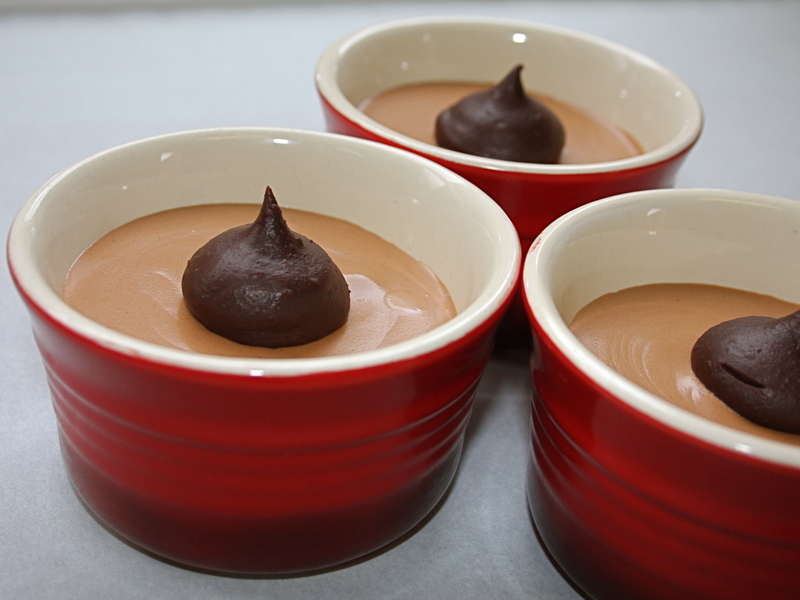 If your in the mood for a little chocolate love this week, this milk chocolate mousse will defiantly do the trick! These are actually very easy to make, and most of the time invested in them is in allowing them to set up. Easy and pleasing… what more could you ask for on this hallmark holiday? Using a whisk combine ingredients and warm for about 3 minutes over rapidly boiling water, until the mix is bubbling just a little and feels warm to the touch. 100g of good quality dark chocolate finely chopped. Allow chocolate to settle into the mix for just a minute before stiring, then combine until silky smooth. Set aside to cool somewhat. Gently fold whipping cream into chocolate 1/3 at a time. Pour mousse into nice glasses or bowls, and allow to set in fridge uncovered for at least 4 hours. Before serving garnish with fresh grated chocolate, a handmade truffle or a dollop of fruit sauce… whatever floats your boat. Enjoy the mousee and the oohs and awe’s that come along with serving this! I am chasing the winter blues away with the most local soup ever, although it’s named French onion soup, it’s really not French at all, what it is however is made entirely with the contents of my food shed + a splash of dry sherry from Australia. This is my hands down all time favourite soup! BUT only when done properly… have you ever been served watery broth with a handful of salad croutons from a box and a sprinkle of the plastic powdery parmesan cheese at some restaurant? Gawd what a sad affair that is. I decided to make this soup because I had lots of yellow onions, local cave aged cheese, a deep craving, and the only herb I have still growing is thyme. It seemed a natural. We are blessed with wild creeping thyme which covers a HUGE amount of grass and roadside at my homestead, and when I built a herb spiral in my garden a couple years ago, I added a big shovelful of this hearty thyme to the base of the spiral. As it turns outs the herb spiral is cozied up just below our walk through cold frame , and I have about 2 sq ft of still living fresh green, un-snowblanketed thyme! Which is pretty fabulous because I actually didn’t dry any thyme this year, so I have been enjoying gentle grazings of this robust fresh herb on occasion. I used a new technique for making French onion soup this time and that is to oven roast the onions in butter (which coincidentally was churned by my neighbour) slowly for hours the day before putting the soup together. I also decided at the same time to boil down a batch of dinosaur sized cow bones, that I hauled home from the latest down the road butchering day. Originally I intended on giving them to the dogs, but when I realized I was out of my home-made beef stock and had no bouillon cubes left… the answer was obvious, and the house smelled divine for the whole weekend as I bubbled away bones, celery, onions, parsley and garlic to yield about 2 quarts of hearty stock. You could of course do this all in one day, and use tetra pack stock (mushroom would be perfect for a veggie version), but It sure added to the appeal of this dish for me to draw the process out, build the flavours and use my friends cow bones to brew up another supply of beef stock for my freezer! On the rare occasion I make a pot roast, I often make this soup the next day mainly because you end up with so much meaty beef stock and I always think this is the perfect venue to use it up in (only after making leagues of gravy of course). I also tend to use a slow cooker to make onion soup, but this weekend, I set out to soak up the onion-y steam and spend some time being very domestic, tending to the stove and the fire (while my partner was up in the forest cutting down dead standing tree’s to keep us cozy through the last push of winter), It also seemed a natural fit. Regardless of if you do this in two days or one, in a pot or in the slow-cooker the first step is certainly the most important to adding a rich deep caramel colour and flavour to this soup. Roast at 300 for about 4 hours, in which time you only need to stir it twice. Paying close attention and stirring very little you want to create a deep caramalized char on the bottom of the pan, once it is all deep brown you want to de-glaze with 1/4 cup of sherry. stir all the golden bits into the liquid and essentially clean the bottom of the pot with your spatula. Do this 2 twice more but on the last time use 2 cups of stock instead of sherry. at this point you can transfer the pot to a slow cooker or the fridge or keep right on making the soup. To make this soup authentic and wonderful you need some oven safe soup bowls. 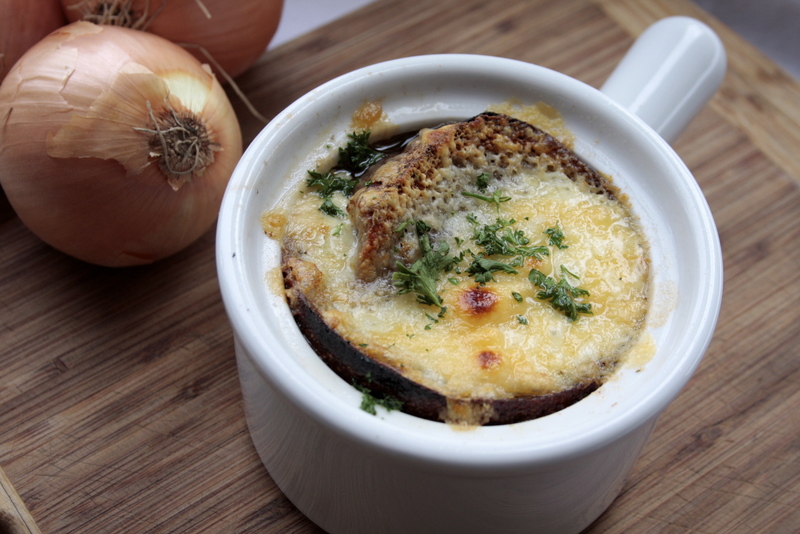 Portion hot soup into individual bowls, top with a thick cut slice of sourdough rye bread, cover with a good amount of gouda, or another aged and robust cheese, sprinkle with fresh parsley and broil for about 5 minutes, or until you can’t take it any more and you have to dive in! 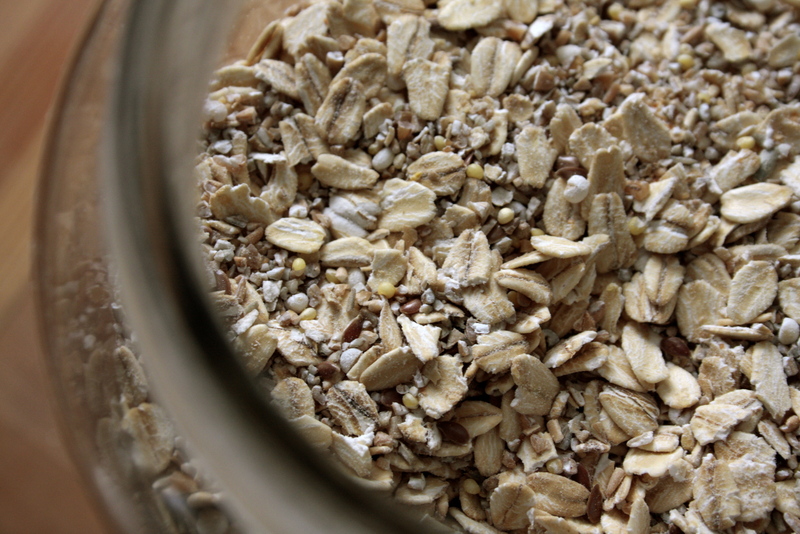 In my possession I have no less than 40kg of nice organic rolled oats which I continue to overlook day after day. I bought them with the intention of eating them each morning for breakfast… but more times than not I fall short on this task, and end up eating a fresh egg on sprouted toast (if anything at all). But I am trying to change that habit, and start with a more whole and hearty breakfast and recently inspired by Heidi of 101 cookbooks and her overnight cereal ritual, I blended up a killer cereal masterpiece. Finally today after looking at this beautiful cereal mix all week, I actually made a huge batch, and everyone, everyone, everyone, was thrilled to devour a big bowl of hot grains laced with coconut, hemp seeds and a sprinkle of brown sugar. mix and shake it all together and store in an air tight jar. Now the cooking part, I loved Heidi’s idea of toasting the grains in butter and then soaking them overnight… the problem is I had forgotten to do so 3 nights in a row… so here is the hybrid technique I used today, and it worked great! 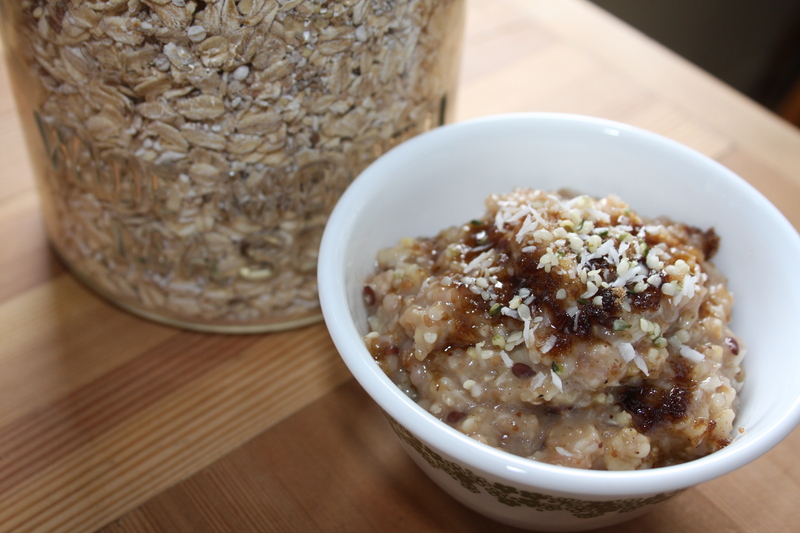 Stir often and toast for about 8 minutes, when the grains will begin to smell fabulous! Pour 3 cups of boiling water over the grain, remove from heat and let soak covered for about an hour. Return to heat with another cup of hot water along with 1/2 cup of coconut and 1/2 cup of maple syrup. Gently simmer for about 30 minutes, stirring often and adding more water as needed. Before serving garnish with seeds, dried fruit, nuts, and another sprinkle of drizzle of something lush and sweet. I remember LOVING baked beans as a child, and I had a very distinct flavour I was seeking to recreate when I made these earlier this week. 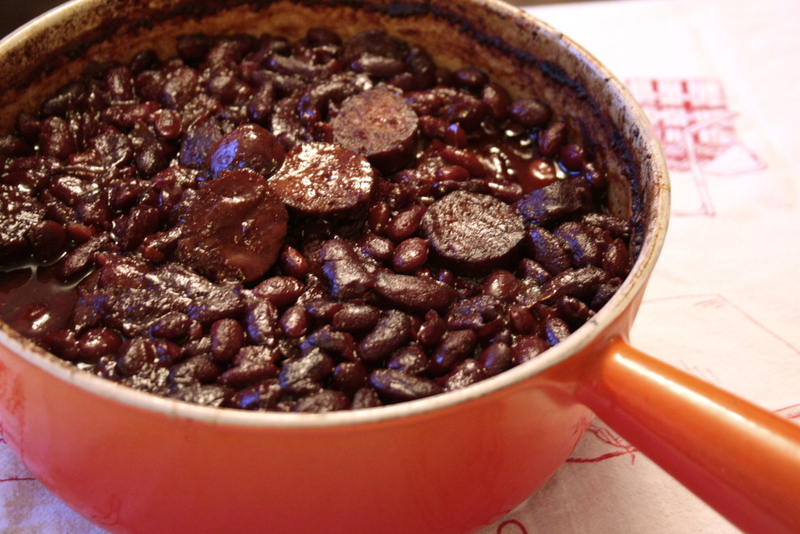 As I have mentioned before my family has very strong British culinary roots, and I have had many a weeknight bean on toast night in my life… but tin beans have nothing on all day sweet molasses baked brown beans. I totally nailed the flavour I was after, and I used this vintage recipe I photographed about a 7 years ago to set me down the right track. While spending a week out in Kananaskis Country in a standard Canadian January trying to keep warm in the -30°c cozied in an amazing old hunter /weavers log cabin with wood heat and a wood stove (not unlike my present life funny enough) I found in the pristine 50’s kitchen a stunning pantry complete with a flour mill bursting with vintage food packaging; herbs, jello, coffee, flavourings you name it. I was in packaging heaven! 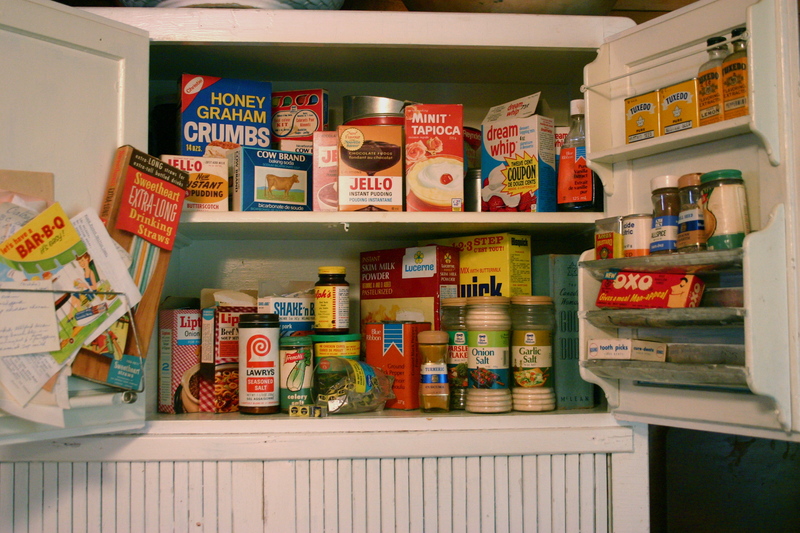 I absolutely adore old food packaging, and have a collection of some really sweet bits and bobs. As an designer (who does a lot of food packaging these days) I just love seeing the way it all began. But back to the beans; I used this recipe and tweaked it (as usual) and below is my version along with a not so appetizing image of the net result.. poor beans aren’t too photogenic even in my vintage le creuset casserole and after a few snaps I soon gave in to the enticing smell that was teasing me all day. We all oohed and awed over these brown beauties, and I think you will agree a beans on toast night with these baked beans makes up for many a tin bean debauchery. Set the beans to boil in fresh water until the skins start to split. DO NOT SALT WATER. Add 3 whole maple pork sausages (or any other piggy product) into the casserole, after they are cooked though you can slice them into 1/4″ slices, stir them in and continue baking so they soak up the sauce. bake at 300 for about 6 hours. Check beans at least 3 times and add more sauce and then hot water as needed. You want a good amount of yummy thick bubbling sauce, so don’t let it bake dry… after all you need to dunk your toast in something! Of course you can omit all things animal from this dish and have a really great meal, coconut oil would be nice in lue of bacon dripping but I wouldn’t ruin a good pot of baked beans with tofurkey sausage or anything like that! Squash is still a hard sell with my family.. as much as I grow it, cook it, and serve it, both of my sweeties turn their nose up at the stuff time and time again. I can manage to get them to eat it, and they both realize this is part of us eating out of pantry and food shed, but it doesn’t mean they are ever going to love it, not even if it’s smothered in cheese! Yet I diligently roast whole squash all the time, and spend the following week tossing it into everything I can dream up. 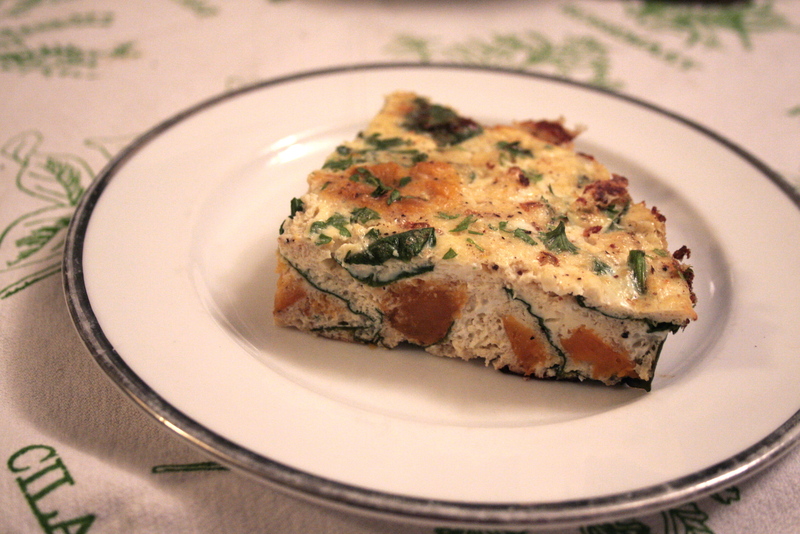 This recipe is another of my attempts to hide said squash into a family favorite; frittata. Frittata is a no brainer for me, what with 20+ laying hens I always have a mountain of fresh eggs, and something or another to add into the mix for a fluffy light and super quick mid week meal. This frittata is made with a hearty amount of really lovely organic cottage cheese, spinach and left over roasted squash. From start to finish it’s on the table in about 15 minutes. 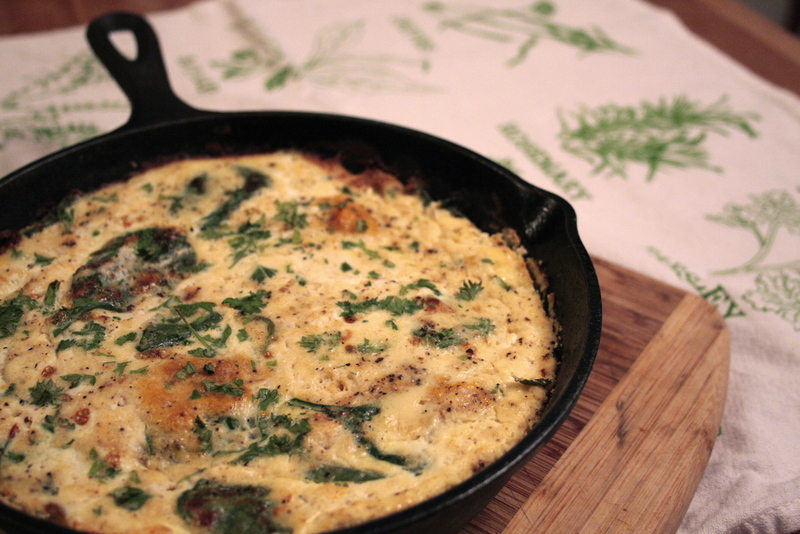 This recipe yields a 8″ frittata (which I made for just two of us tonight) double this for a 12″ pan and a family meal. Also I only ever use cast iron pans to make this as it’s a fry and bake method. Cover greens with egg mixture poured into pan evenly. Allow it it cook undisturbed for about 5 minutes, until the base and sides are cooked and firm. Remove from ellement and put in the centre of the oven for 10 minutes. Once the egg is almost entirely set turn oven to broil and brown the top for a minute, until golden bubbling and complexity set. Breakfast, Brunch or Dinner this is a great meal, and leftover slices are awesome on the go food, even cold. I love this for dinner with a huge green leafy salad. Frittata filling combinations are endless…. whatever you have on hand. Sub red pepper spread or miso for mustard, add happy bacon or wild edibles like stinging nettle, caramelized onion with roasted garlic and gouda is one of my favourite versions of this easy dish. Be creative and enjoy! I made this dish a few weeks back, and totally spaced on posting the recipe. 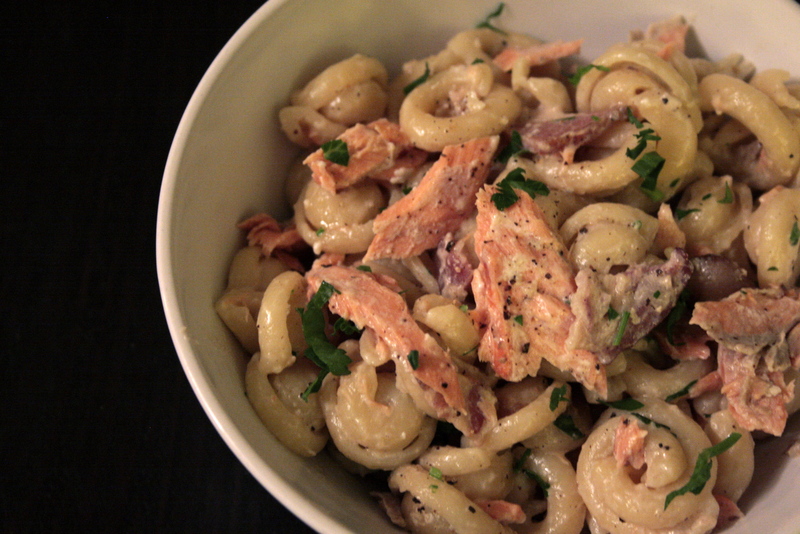 This is yet another easy creamy pasta recipe but this one features my own home made smoked canned salmon! The pasta I used is a beautiful shape which really holds the sauce and looks so pretty… no idea what it is called, but it was made in Italy and is a semolina egg noodle variety. Start by cooking enough pasta to serve 4 to your liking. Stirring often slowly add about 1/2 cup of cream then and add 1 can (pint jar) of smoked canned salmon. Once the pasta is finished cooking reserve about 1/2 cup of the water, before straining. Gently toss cream sauce with pasta and add some of the pasta water (just enough to keep the sauce silky and coat the noodles). Try not to break up the salmon too much, you want nice chunks… not cream of salmon. Finish with a handful of chopped fresh Italian parsley and more fresh ground pepper. What a great way to enjoy an indulgent pantry item like canned salmon! * Anytime I eat fish (which is EXTREMELY) rare these days, I want to be certain of it’s origin, and how it was caught. The canning I did this fall made it easy as I caught half of it, and the local natives caught the other half, so having safe sustainable fish on hand is a real treat for our house. I never buy farmed salmon, and I never order fish when eating out. I don’t actually buy fish or meat at all in the grocery store, because frankly I just don’t trust the industrialized food industry with the health of my family or my planet. If your still buying sole fillets from the grocery store, or bags of frozen prawns I would urge you to get informed on the current state of the seas and the food coming from it, you’ll likely be surprised and even horrified. Here is a post I did way way way back on the topic of seafood, which is full of some really great video and books to help you be a more informed consumer. Vanilla has the most wonderful aroma, and is essential to all things baked and sweet and delicious. I am fortunate to have a mother in law who regularly travels to Mexico and always brings me gifts of vanilla extract. 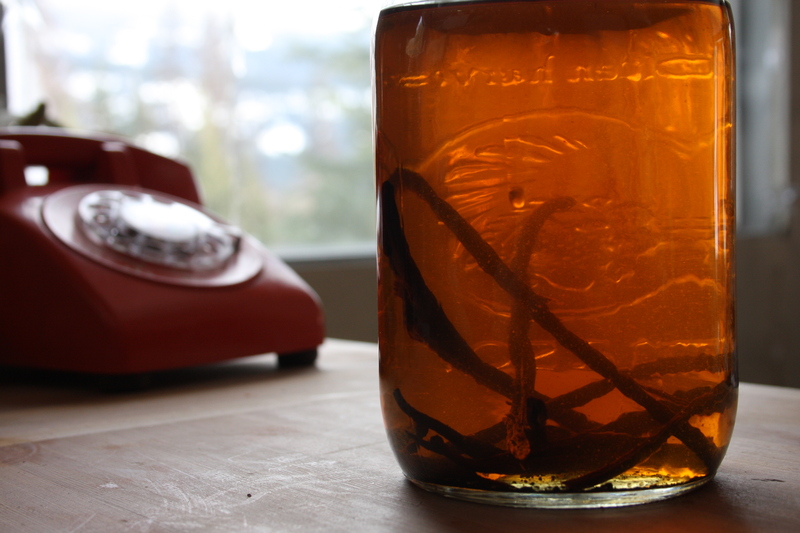 Recently I ran out of my seemingly endless supply, and I decided rather than spending $16 on a teeny tiny bottle of organic vanilla extract, that I would make my own. The image you see here is where my brew is at currently, 1/2 way through the process of slowly steeping whole organic Madagascan vanilla beans in vodka. The mix smells intoxicating, and budget wise, I think it’s a pretty fair option. I spent $26 on a bottle of vodka, and used 3 whole beans which cost $9, The batch will yield 1L of deep rich pure vanilla extract. The brew is growing darker and deeper in colour each week, and essentially all I need to do is give it a little shake shake shimmy every day or so. Once it has brewed for 3+ months, strain fluid and bottle. The whole beans and small pod bits can be added to a large jar of organic cane sugar to draw even more flavour into your kitchen! I think the only place I have ever had this delicious street food is at the Edmonton Fringe Festival, and for me this flavour is synonymous with crowds and summer and theatre and my cousins. I can’t believe more street vendors haven’t cracked into this easy and yummy vegetarian festival food market. 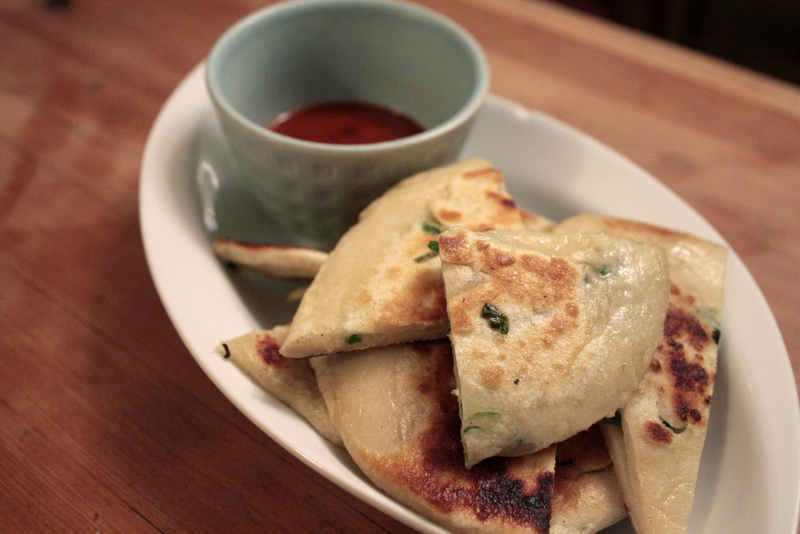 I stumbled across a recipe for green onion cakes last week and have been dreaming about them ever since. This dough is so silky and simple… just flour and water. I used organic white wheat flour for this recipe (and paid dearly for my indulgence later, as I do with white wheat always) … somethings just require the softest whitest flours to work, and I think this is just such a glutinous occasion. I was imagining this flour as a thin dumpling dough for steamed buns, and I think it would work great in these types of applications. I plan to try this with a really white spelt, and to steam it and see if it reacts as I imagine it might! If is works you’ll hear about it.. otherwise the chickens will enjoy it! They are far less picky than I.
flour, water, green onions (about 5), sea salt, veggie oil, sesame oil. In a small boil combine 1/3 cup organic veggie oil with a drizzle of sesame oil, and set aside. In a large bowl combine 3 cups white flour with 1.5 cups of boiling water, kneed for 5 minutes until elasticity and silky smooth. (I just kneaded in the bowl and skipped the flouring a surface and cleaning a surface step all together), form dough into ball, brush with a little of the oil blend, and cover with a clean tea towel. Rest dough for 30-60 minutes at room temp. Divide dough into 8ths, and flatten each portion by hand, brush with oil on both sides, sprinkle with a pinch of chopped green onions, then fold dough over, and roll into desired shape. I made some circular and some more rectangular in shape. brush again with oil and asprinkle of course sea salt. In a hot frying pan brown both sides of the cakes, cooking with a lid, so as to steam and fry at the same time. Each side takes 2-3 minutes to cook. Serve hot with a nice spicy dipping sauce. Sorry my celiac friends.. this recipe is NOT for you.